Here is an example of a PAP compliance report. This is from the user/drivers PAP memory chip, usually an SD type card they can produce or report from or their PAP machine vendor can get it for them to present to their doctors, or a code generated from the machine they can input online to generate the report. This one is for a period of 90 days. Note that usage is greater than 4h/night on at least 70% of nights (89%), demonstrating excellent compliance with treatment. The AHI is also 3.9, you want to be sure it is under 20. If it is higher than 20, they may not be well controlled and should be sent for adjustment of their PAP machine settings. In this case, with good control, I would then give a 1 year certification and check a similar report at that time which should show 70% of the time over a year of minimum 4h/night. Of course you still want to be sure there is no excessive daytime sleepiness nor any other criteria that would impede safe operation of a commercial vehicle. Where in west phoenix arizona can I have my CPAP chip compliance report printed . What establishment provides thst service . I need to find out how to get my compliance report on my own, from the SD card in the device. I realize that was not a direct question. What I’m getting at is that I need to retrieve the data to provide for a medical physical and it has been proven that I can’t rely on the original device supplier for a timely response with the compliance report. I need a step by step on how to do so. If need be, we can correspond via email for the answers. I appreciate all the help I can get, my career is on the line. Sorry Keith, we don’t provide that service, you’d have to get it from the manufacturer or your medical equipment supplier that provided the device. Check with the manufacturer or your medical supply company. Many have a chip or SD card that can be read on a computer. 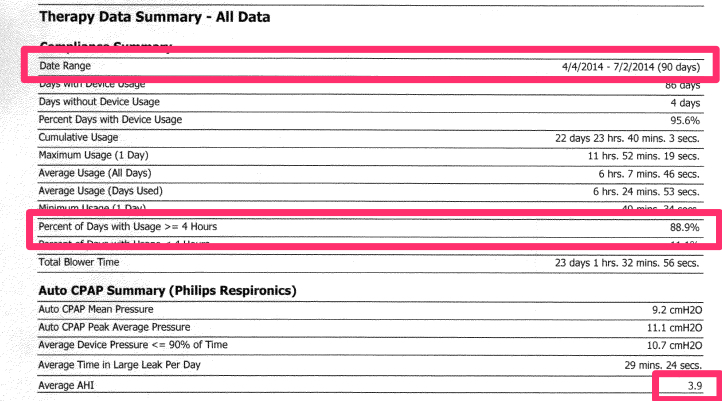 Will my changing the cpap mask affect the readings? 2. The business that I bought my machine from is no longer in business, do you have any recommendations? Can I do the report myself or do I have to take it some where? Can you print the compliance report on your own? Check with your vendor or manufacturer – we do not have specific information regarding CPAP machines. I have been on a cpap for about 7 years and I don’t sleep any better with it than I do without it. Other than having to fight with the tube. I truly believe that it’s nothing but a gimmick to get more of a driver’s money but they use mostly to get read of drivers after they have been in industry after so many years. Its nothing but a scam. You give the same comment to everyone. Same question, same answer. At least I’m consistent!